Hi everyone! 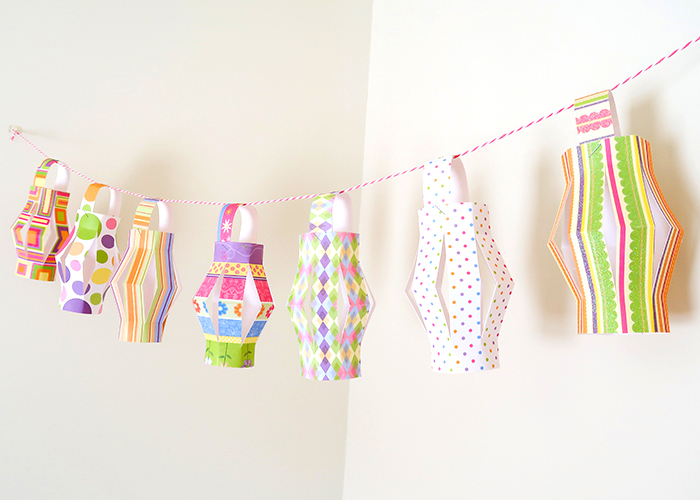 Today I’m going to show you how to make this Summer Paper Lantern Garland! 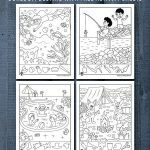 This is the perfect decoration to add to a kid’s room, for an outdoor party, or even to add a splash of color to a bare corner. You can also use the lanterns by themselves, set over a battery operated candle, to brighten up a night time event. Here’s what you’ll need. Paper. 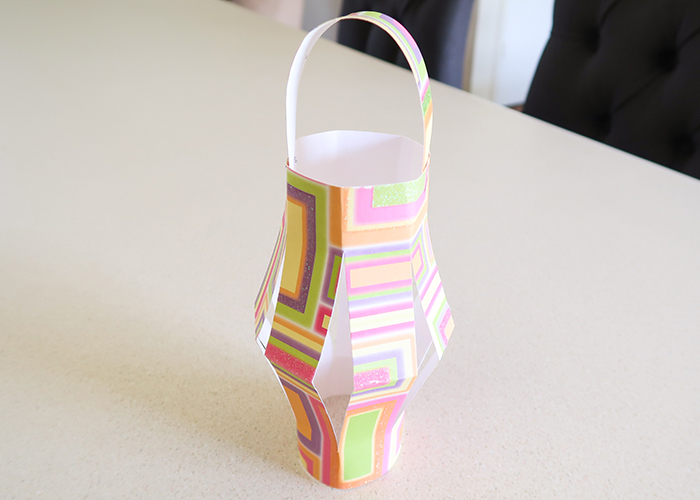 I used 8×8 inch paper, but you can use whatever size you would need for the size of lanterns you want. 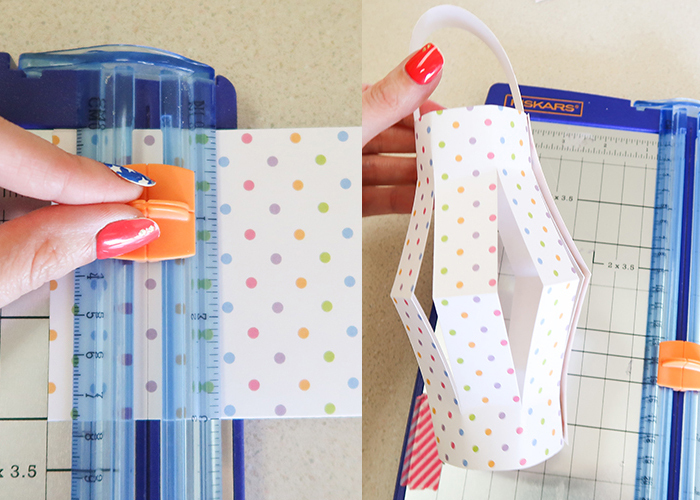 Scissors and ruler OR a paper cutter. Both work equally well. 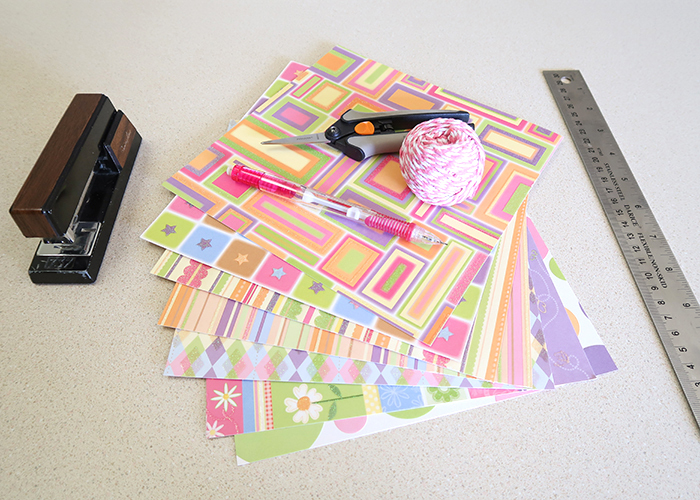 Start by laying your paper patten side up. I’m going to measure and cut two inches off one side of my paper so I have a 6in x 8 in rectangle. Then I’m going to take the strip that I cut off, and cut it in half lengthwise. You’ll have two strips of 8 inch by 1 inch paper. You can discard one of the strips, but set the other one to the side. We’ll need it in a minute. 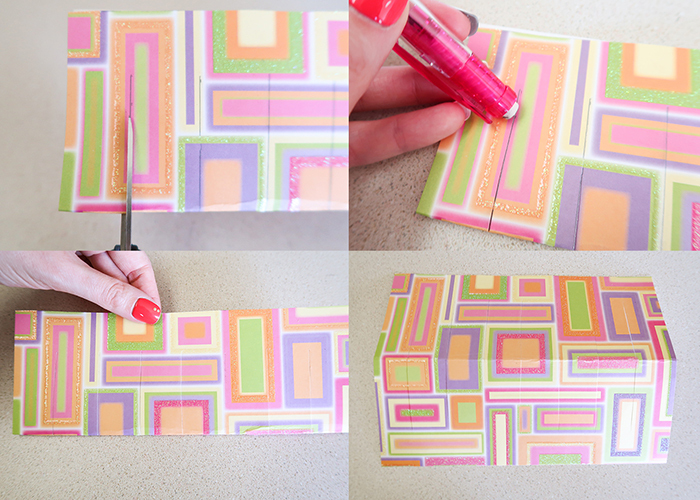 Now take your 6 x 8 in piece of paper, and fold it in half lengthwise, with the open ends pointing up. You’ll be cutting into the fold. 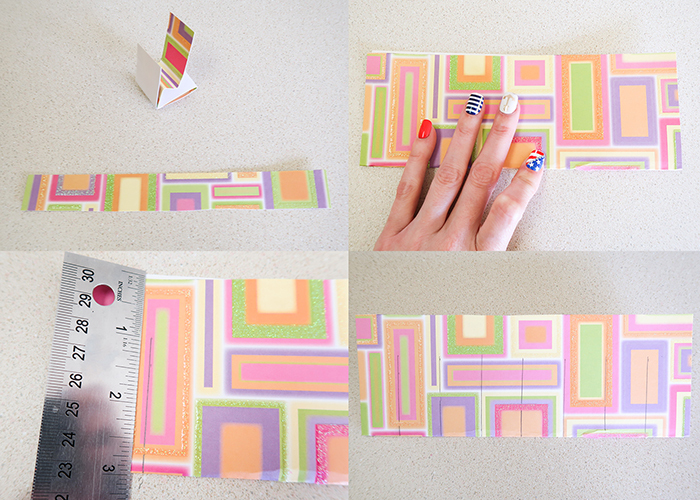 Now take your ruler and measure 1 inch from the top (open ends) of the paper, and draw lines 1 inch apart like shown. Cut along those lines, and then erase the pencil marks. Open your paper up. Now roll it into a tube, overlapping the ends by an inch so the slits match up. The slits in your paper should be going up and down. Staple the ends so it stays closed. Next, stand your tube upright and gently squish it with your palm. It should bend out where the fold was like a flower. 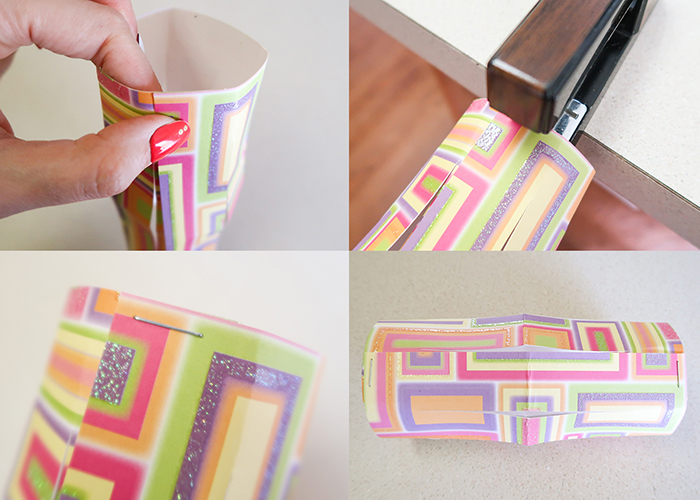 Use your fingers to crease the bends even more so they stay bent outwards. 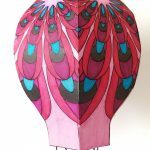 Can you see the lantern taking shape now? 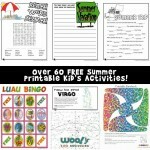 Grab that piece of 1 x 8 in paper we set aside earlier. You can keep it as is, or trim it down for a shorter handle like I did in the photo above. Now attach it to the top of your lantern with staples, sliding the ends behind the lantern edge by about half an inch or so. Ta da! You have your first lantern! Isn’t it cute? 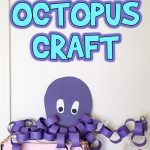 You can set it over a battery operated candle if you want it to stand up and glow, or continue below to learn how to make it into a fun garland. 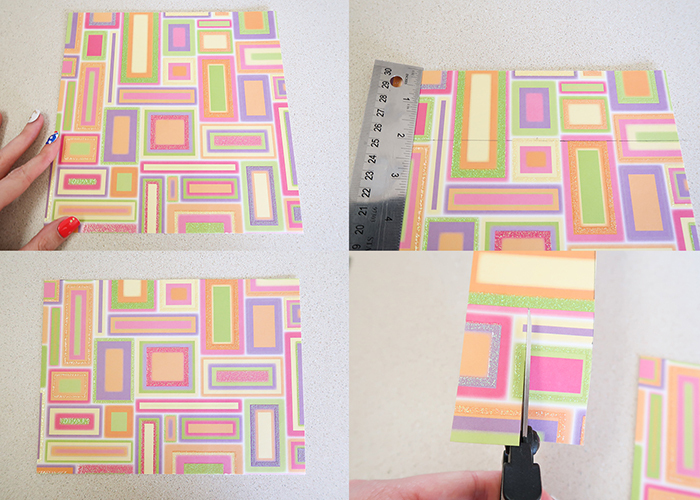 You can also make these fairly quickly using the built in measurements on a paper cutter. 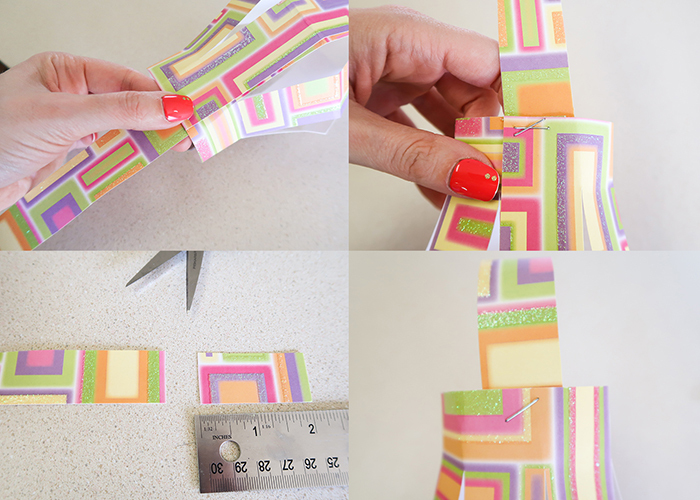 Just make sure to cut into the fold when you’re making the slits, or you’ll have to start all over! 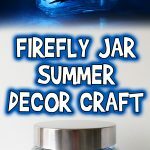 You’ll need at least 5-7 lanterns for a garland, or more if you want a longer one. 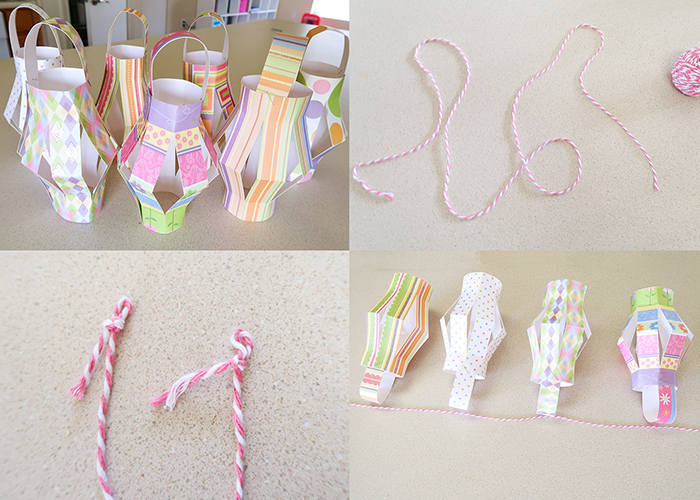 Make all your lanterns, and then measure out a piece of twine to the length you want your garland. Tie slipknots in the ends for hanging it later. Set all your lanterns along the edge of the twine, spacing them out evenly. Then run the twine through the lantern handles. This part is optional, but it ensures that your lanterns stay in place and don’t all fall together in a big clump. With the lanterns placed where you want them on the twine, pinch the twine against the handle of the lantern and staple it in place. 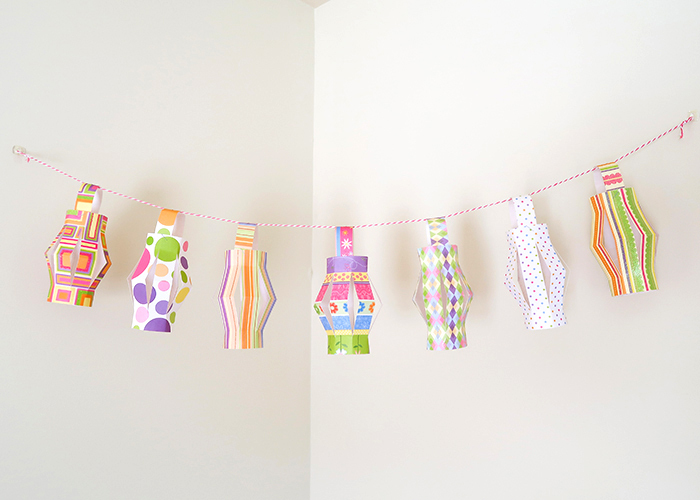 This will keep the lanterns where you want them to be, even if the wind kicks up during an outdoor party. And you’re all done!! 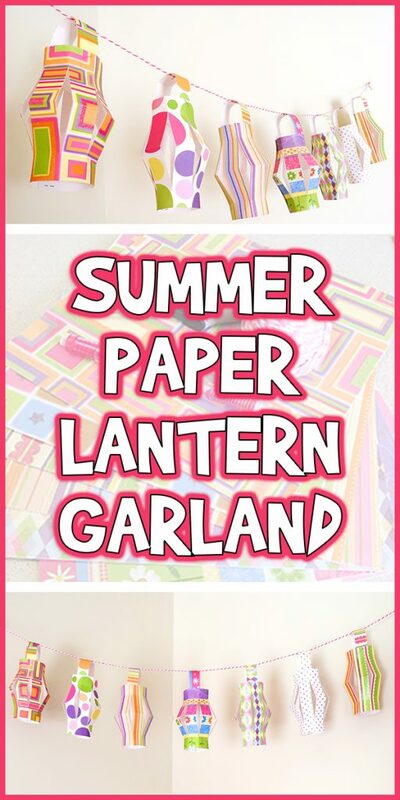 I hope you enjoyed this Summer Paper Lantern Garland project. 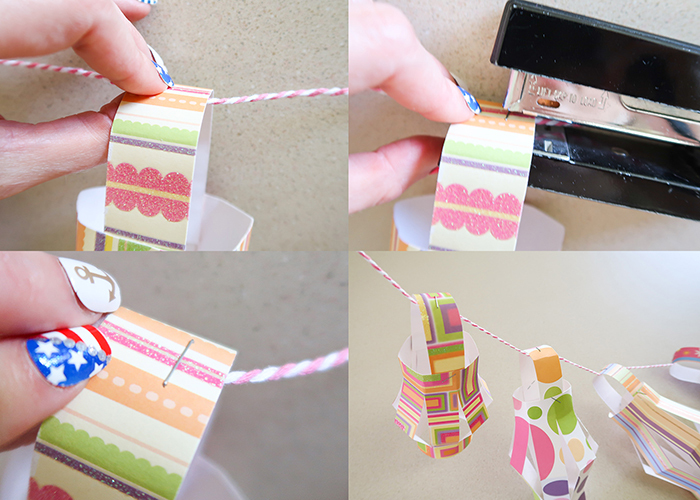 For another pretty garland idea, check out my Tissue Paper Tassel Garland Tutorial!